A while ago I shared this fish as a work-in-progress. 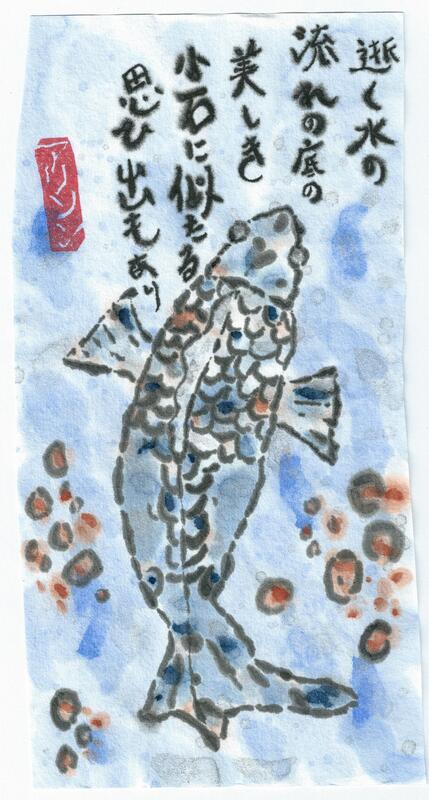 Here is the end result, with the poem by Yukawa Hideki. This is intended as a gift for my mother, as a remembrance of my father, who loved to fish. I miss him a lot. Ah, very nice, Alison. Feeling rather melancholic tonight. Just lovely! I like the idea that the pebbles are as memories — subtle and winking up through the water. Beautifully drawn too! Thanks “Blorgie” for your kind words.